SPUDVISION: MAX IMP SAYS VOTE! Telltale Games is currently fielding votes for which of their series of games should be the next to release for the Mac. 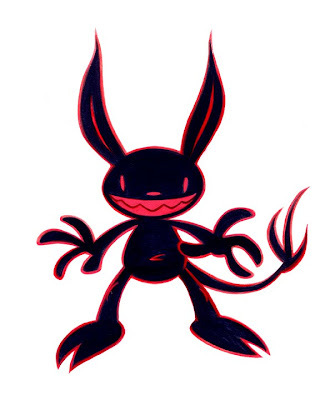 Max Imp insists that you go to their site and cast your vote for Sam & Max. Imagine Max Imp's disappointment if Sam & Max is NOT chosen or perhaps loses by the one vote YOU may have cast. He might be inclined to take up residence in your furnace, compelled to skitter around in your attic during the night or crawl up into your sinus cavity while you sleep to lay his terrible eggs. Do your part! Go to TelltaleGames.com and cast your vote for SAM & MAX! Now, get away from me!!! So, when's that design going to grace a t-shirt? Anyways, voted. Though the Freelance Police have the Homestar Runner stampede to deal with. "So, when's that design going to grace a t-shirt?" Got my vote and a tweet! I voted. I need Freelance Police on my mac! Gosh, I love him... I think I will not vote for Sam & Max. deleitable disain xD, i most vote, the text is too effective. I'm a PC user and proud to distort market research. Only kidding I have a mac too. voted for sam & max! etc and i would be proud to do a interview with you via e-mail. if it's possible or not reply me to my e-mail daniloguarino805@hotmail.com! Hey Steve, any chance you could sketch a quick Angel Max to compliment the Imp Max, I'd really like to get them tattooed on my legs. Thanks! This design is very similar one that I sow when I was a child, in a program called Monsters produce by viagra online . I always sow it in Nickelodeon and the name of the personage was Icky.